Since its impossible to get race photos from Australian race tracks, I give you instead the view from my window .. yes, it's chilly autumn at Gerolstein.. 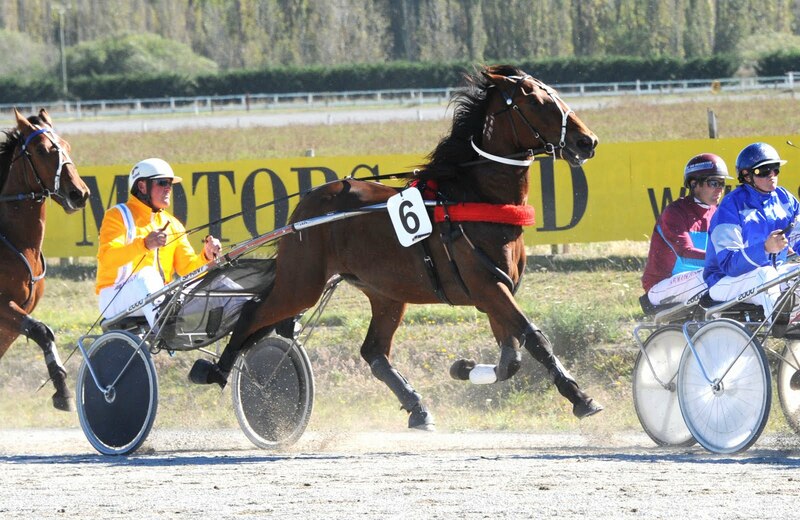 This week Yarra was hosting the first heat (of five) of the prestigious Vicbred Superseries. Since we’d paid the entry fee, we decided ‘why not go’? The biggest guns might not go to Yarra, they might wait for the heats at Mildura or Shepperton. We might sneak a fourth and get into the semi-finals, or even eventually and marvellously even the final: theoretically the top ten or twelve fillies in the state.. Terrific, yeah. For some. But at least he gave us a place chance..
Well, he was right. Aussie Made Lombo made straight for the front, with Livia right behind her. Bella’s Delight duly sat parked, without unhappily putting any pressure on the leader, who, unchallenged, ran along the 1200 metres into the straight in a fair 1min 31secs. In the last 200 metres, Livia made a gallant effort up the passing lane, but she could not get closer than half a length to the cruising favourite, and in the end she was edged for second by a slightly disappointing Bella’s Delight, who seemed to have settled for second from the outset. Well, I guess we would have signed for third! But we tried. And I’m sure we momentarily got into second ..
I’m greedy now. Oh! how I wanted to be second! But we finished a length behind arguably the best Victorian filly of the 3 year-old generation, so how not be pleased? … even if they went no faster than last week. So Way2Bet got it right again … and, while Lively Moth, Milliara Lombo and Rhodium Castle go to Mildura to battle out Heat 2, Livia lives to fight another day. And probably a semi-final. Hopefully not, this time, against Aussie Made Lombo! With my recent lack of right-handed volubility, my state of health and horses who win have been the only topics to have got a look in here ..
‘What about the pets’? Okay, here they are ..
Minnie, looking slim, fit and lazy, curled up on the John Siddeley couch ..
Mr Peacock perching on the water tank. Last year, while I was back in Berlin, he disappeared for the winter. We’re feeding him many delicacies this year in the hope he will stay.. The horses? Well, here are the babies. Thomas and Anna, the Berlin babes, have been weaned from their mothers and introduced to the joys of a halter and a coat. Used to hooning around a 4-acre paddock, they aren’t altogether happy about spending time in the crush learning to lead and tie up! And the newest addition to our team of boarders, little Rocky, brother to Patti, and like Thomas, a son of P FortySeven ..
Flattering, but we do hate being made favourite. Well, we had our wish. She didn’t go out favourite. Somebody (probably the commentator, who seemed obsessed by her) plunged on Samantha Sparkle. who went out at a bit better than even money. Livia was 3-1. Well, the commentator was wrong with his tipping and Way2Bet (as frequently) was right. Livia dropped to the rear, from her outside draw, got interfered with by an ill-gaited out-the-back horse called Mondayitis, and Graeme decided ‘better get out of here’. He pulled Livia three wide and midfield ... and there she sat for a whole exhausting lap. Could she do that and run on? Oh, yes. Into the straight and the bright red nose roll flashed as she pulled out her trademark home-run sprint, duly – as Way2Bet had it -- pelting past the pacemaker, It Takes Courage, 50m out, for a narrow, but comfortable victory. Much to the discomfort of the commentator who hopefully called Samantha Sparkle in first (she was an OK 3rd after having the trail all the way! ), and much to the delight of her owners, watching on telly, thanks to NZ Trackside, on the other side of the Tasman. And she even tickled the famous 2 minute-mile (2.00.9), in spite of running about 50m extra, thanks to her wide berth in transit. Phew! What a wee dazzler. So, I got my win number 37, and the way things are going I very well may make it to the fabled 40 in 2011. Which will be a decided help in my cure .. I slept like a babe, after the race (Interdominion Final? What Interdominion Final?) and awoke with altogether less aches and pains. A win a week would be just what the doctor, literally, ordered! PS No photo. Yet. Tracking down the Victorian race photographers is trickier than mailing NZ Race Images. But I’ll keep trying! In the meanwhile here is our wee girl with Kim, who visited her while in Victoria. Yes, the reason that the blog has been dormant for two months is that on 12 February 2011, just three days short of my officially becoming ‘elderly’, I suffered a series of what the French call ‘cerebral incidents’. I was ambulanced to Christchurch Hospital – arm withered and speech awry – after the first, suffered two more while lying in the ‘waiting room’, and the granddaddy of the group during the night, in the ward. Yes, the ward. Not my scene. I am into private rooms. I do not wish to share my misfortune with others, and I certainly do not wish to share theirs. So, it was out with my Ellen Terry act (such cut glass, un-slurred English you never heard), fling aside the walking frame, and put on a convincing imitation of a laddie who had merely gone through a bumpy TIA ... I had shepherded Ian through enough of them to know what they’re like .. rather than a stroke. I was released after one more night, my lovely Geraldine fetched me and ferried me home, and so I passed my 65th birthday – just! – in the comforts of Gerolstein, with Wendy and Kim. The effort and the act told on me, of course. The eight weeks since have been a calvary of aches and pains and above all, frustrations. I ought to give details – for nowhere, no-how, could I find out what I should be feeling, what remedies I should be taking, and whether I should be resting to let the ‘hole in my brain’ heal or exercising to force life back into my affected limbs .. But, a week after I came home, Christchurch suffered its earthquake, and my personal earthquake obviously took its place of importance in the scheme of things. For other people. What has happened to me? Well. It is a stroke and not a TIA, and the right side of my body is affected. Principally my arm and shoulder, which I was initially unable to lift, but which I have bullied back into some sort of usability. I could neither write my name, nor lift the right hand to the level of the keyboard to type, nor move the powerless fingers to find or tap a key. It’s coming gradually. Even yesterday I could not have typed this piece without exhausting my back and shoulder, and making hundreds of maddening ‘erreurs de frappe’ with the aching, stretching hand and fingers. I can sign a cheque again, I can print legibly, but cursive writing is harder. I can scrub a pot, lift (wonkily) a kettle, pick up things like coins, shave myself rather feebly, brush my teeth, drive a car, and – the big test – lift the arm to pat and brush a horse. How much more will come, we shall see, but the typing is the thing that matters to me..
My face was not good. The effects of the old Bell’s Palsy increased. My mouth and eye drooped nastily, I bit my cheek when chewing, at the first tiredeness my speech became worse than slurred. I took the same cure as I did 30 years go. Acupuncture, from my new friend, Brett. And I will continue to take it. The face now shows no signs of damage, the speech only fails when I am very tired. Tired. Ay, there’s the rub. Power, energy, strength … those things cannot be faked or forced. I will have to wait before being able to spend more than a few hours in a row without lying down. That is just how it is. I leave it to you to imagine to which rules I adhere faithfully, and which not. So, here I am. On the mend. Will I mend wholly? How much will I mend? And will my new sort-of Hygienic Life be any fun? And my equine friends, too. 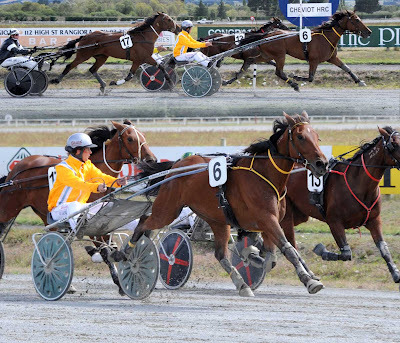 They have well chosen their moment to perform ..
From the hospital ward, I heard my little Fritzl run second at Waikouaiti … and from my armchair, I watched him win his first race, so tantalisingly near, 15 mins drive away at Rangiora. I roused myself and went to the track soon after to watch D’Arcy run his first real race – fifth, but breaking the NZ record . And, on the other side of the ocean, lovely little Livia ran two smashing races in Victoria: coming from last to mow ‘em down to win at Maryborough, and the following week storming home for 2nd at Melton. I should have been leaving for Berlin this week. I won’t be of course. I will have to spend much of the winter marooned in New Zealand. All the pals will be – Kevin, PGB and Uwe, Olli, joli Thomas, Thomas and Wolfgang, Anna, Mirza and Hannes -- only I will be missing..
All because of a damned stroke.